The Congreso de los Diputados (Congress of Deputies of Spain) is the seat of the lower house of the Spanish Parliament, and the building where the Parliament is located is called the Palacio de las Cortes de España. 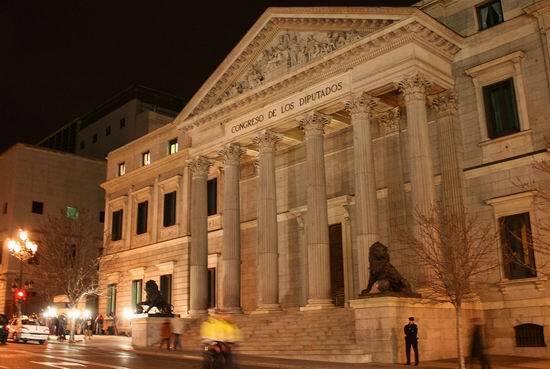 It is considered to be one of the finest examples of late neoclassical architecture in Madrid and was built in 1843 under the direction of the architect Narciso Pascual y Colomer. Queen Isabel II laid the first stone in a ceremony in November of that year. 4,000 guests were invited to the inauguration ceremony, which involved incorporating into a building a time-capsule in the form of a lead casket. It contained gold, silver and bronze coins, a copy of the Spanish constitution of 1837, copies of that day's newspapers and the silver spade with which the Queen poured the cement onto the first stone. In November 1850, the Queen presided over the first opening of Parliament in the new building. The front of the building is in three parts, the central part consisting of steps up to impressive columns which lead to a large bronze entrance door reserved for the King on State occasions. Crowning the front part is a pediment containing a bas-relief by the sculptor Ponciano Panzano, representing Spain embracing the constitution, and surrounded by figures representing Strength, Justice, Science, Harmony, the Arts, Commerce, Agriculture, Waterways, Abundance and Peace. The bronze lions at the front of the building are also the work of Ponzano and were forged in Sevilla. Inside, the hemiciclo forms the main parliamentary chamber, and contains representations of Queen Isabel II on her throne, surrounded by important Spanish historical figures. Two statues of the Catholic Kings Ferdinand and Isabella sit in the centre. The impressive library is on three floors, contains over 100,000 books and manuscripts, and is used for research. The building changed its name twice under dictatorships, finally reverting to its original name of "Congress" with the arrival of democracy in the 1980s. The Spanish political system involves an upper and lower house (the Senate and the Congress of Deputies), and the King is the head of a parliamentary democracy. The building is open to the public for guided tours on Saturday mornings between 10.30am and 12.30am (except in August and the first week of September), and visitors are required to show a passport or ID. Group tours can be booked by letter or email, or by phoning 91 390 65 25 or 91 390 65 26. This Spanish Parliament building is located on the Carrera de San Jerónimo street, opposite the Plaza de las Cortes. It is just a short walk from here to the nearby Thyssen-Bornemisza museum in one direction, and to the central Puerta del Sol Square in the other. The nearest metro station is Sevilla.